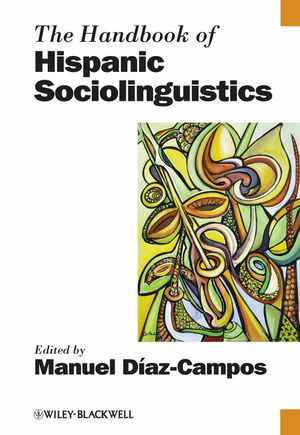 This Handbook provides a comprehensive, state-of-the-art overview of theoretical and descriptive research in contemporary Hispanic sociolinguistics. Manuel Díaz-Campos is Associate Professor of Hispanic Linguistics at Indiana University, Bloomington. He has published on acquisition of sociolinguistic variables in L1, sociolinguistic variation, and topics in Spanish laboratory phonology. He is editor of Selected Proceedings of the 2nd Conference on Laboratory Approaches to Spanish Phonetics and Phonology (2006). 1 Laboratory Approaches to Sound Variation and Change (Laura Colantoni). 2 Variationist Approaches: External Factors Conditioning Variation in Spanish Phonology (Antonio Medina-Rivera). 3 Internal Factors Conditioning Variation in Spanish Phonology (Francisco Moreno-Fernández). 4 Socio-phonological Variation in Latin American Spanish (John M. Lipski). 5 Sociophonological Variation and Change in Spain (José Antonio Samper Padilla). 6 Variationist Approaches to Spanish Morphosyntax: Internal and External Factors (Scott A. Schwenter). 7 Variation and Grammaticalization (Rena Torres Cacoullos). 8 Morphosyntactic Variation in Spanish-Speaking Latin America (Paola Bentivoglio and Mercedes Sedano). 9 Morphosyntactic Variation in Spain (María José Serrano). III Language, the Individual, and the Society. 10 Aging, Age, and Sociolinguistics (Richard Cameron). 11 Gender and Variation: Word-final /s/ in Men’s and Women’s Speech in Puerto Rico’s Western Highlands (Jonathan Holmquist). 12 Forms of Address: The Effect of the Context (Diane R. Uber). 13 Becoming a Member of the Speech Community: Learning Socio-phonetic Variation in Child Language (Manuel Díaz-Campos). 14 The Relationship between Historical Linguistics and Sociolinguistics (Donald N. Tuten and Fernando Tejedo-Herrero). 15 The Acquisition of Variation in Second Language Spanish: How to Identify and Catch a Moving Target (Kimberly Geeslin). 16 Spanish in Contact with Quechua (Anna María Escobar). 17 Spanish in Contact with Guaraní (Shaw N. Gynan). 18 Spanish in Contact with Catalan (José Luis Blas Arroyo). 19 Spanish in Contact with Portuguese: the Case of Barranquenho (J. Clancy Clements, Patrícia Amaral, and Ana R. Luís). 20 Spanish in Contact with Haitian Creole (Luis A. Ortiz López). 21 Palenque (Colombia): Multilingualism in an Extraordinary Social and Historical Context (Armin Schwegler). 22 Spanish in Contact with Arabic (Lotfi Sayahi). V Spanish in the United States, Heritage Language, L2 Spanish. 23 Spanish in the United States: Bilingual Discourse Markers (Lourdes Torres). 24 Functional Adaptation and Conceptual Convergence in the Analysis of Language Contact in the Spanish of Bilingual Communities in New York (Ricardo Otheguy). 25 Code-switching among US Latinos (Almeida Jacqueline Toribio). 26 Language and Social Meaning in Bilingual Mexico and the United States (Norma Mendoza-Denton and Bryan James Gordon). 27 Intrafamilial Dialect Contact (Kim Potowski). 28 Heritage Language Students: The Case of Spanish (Guadalupe Valdés and Michelle Geoffrion-Vinci). 29 Language Maintenance and Language Shift among US Latinos (Jorge Porcel). 30 Mockery and Appropriation of Spanish in White Spaces: Perceptions of Latinos in the United States (Adam Schwartz). VI Language Policy/Planning, Language Attitudes and Ideology. 31 Planning Spanish: Nationalizing, Minoritizing and Globalizing Performances (Ofelia García). 32 Bilingual Education in Latin America (Serafín M. Coronel-Molina and Megan Solon). 33 Variation and Identity in Spain (Juan Manuel Hernández-Campoy). 34 Variation and Identity in the Americas (Mercedes Niño-Murcia). 35 Linguistic Imperialism: Who Owns Global Spanish? (Clare Mar-Molinero and Darren Paffey).